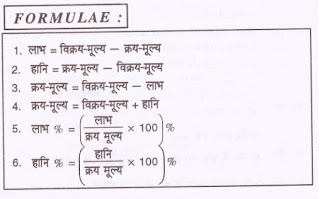 In this post we are going to give some most important short tricks of Profit and loss questions in Hindi as well as English language. 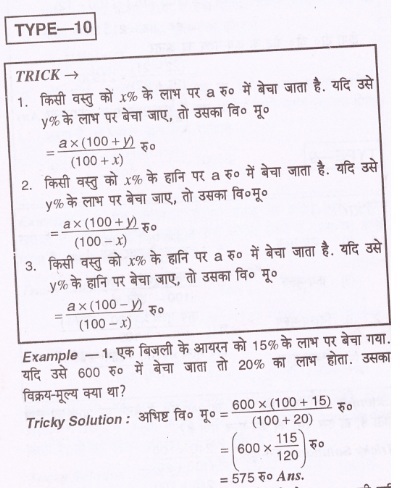 This is very important tricks for those who want to clear various government departmental competitive examinations. because for checking accuracy and speed of candidates the examination board check through various aptitude chapters. The price at which a anything is sell is called Selling price. If selling price of anything is more than its cast price then there is profit. If cost price of anything is more than its selling price then there is loss. 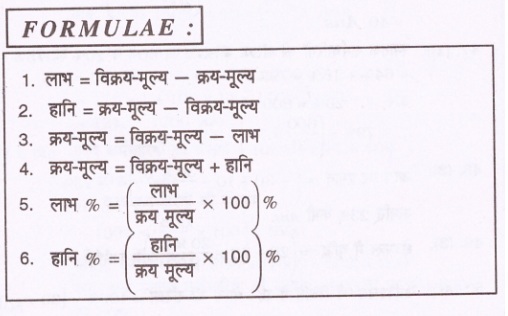 If profit at per 100 rs is known as % profit. 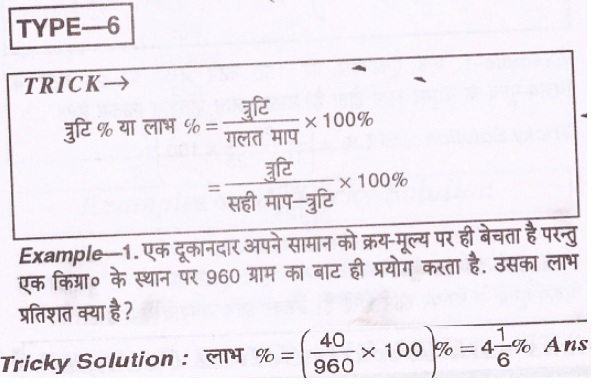 If loss at per 100 rs is known as % loss. In bringing thing on its right place bus rent , train rent , porter rent , taxi rent , rent of shop , salary of staff salary etc. Expenditure of seller is called extra expanse. 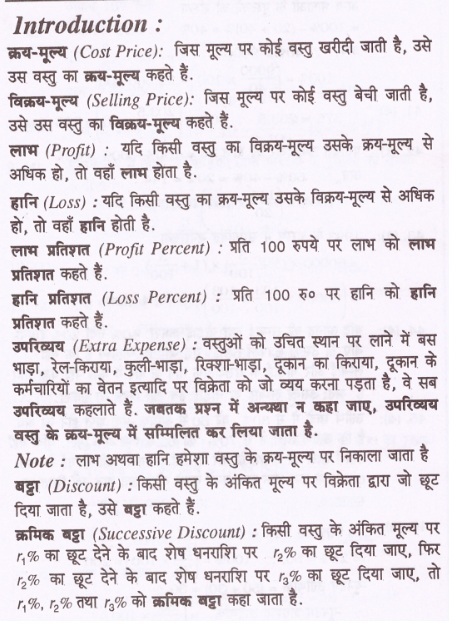 The concession given by the seller on printed price s called discount. 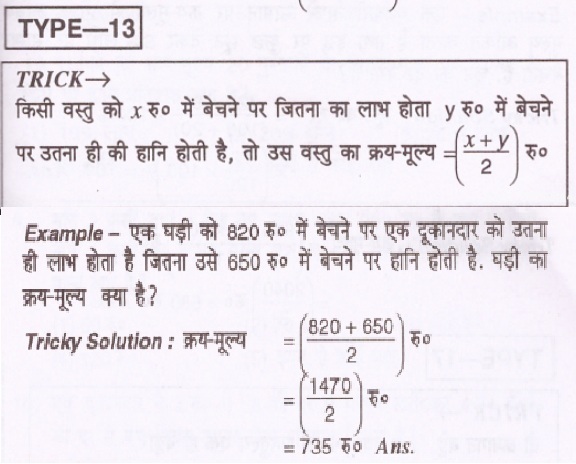 Example:- If cast price of 21 apples is equal to selling price of 15 apples , then find profit% ? the cost of the horse. Hence, C.P. of the horse = Rs. 1200. = Rs(95/100 x90/100 x 80/100) x 100 = Rs. 68.40. ... Required discount = (100 — 68.40)% = 31.6%. available at Rs. 105. If the second discount is 12.5%, find the first discount. If he sells these pens giving a discount of 1%, what is the profit percent? Profit%= (3.60/36 x lOO) % = 10%. 33% after allowing a customer a discount of 5%? Let C.P. = Rs. 100. Then, S.P. =‘Rs. 133. 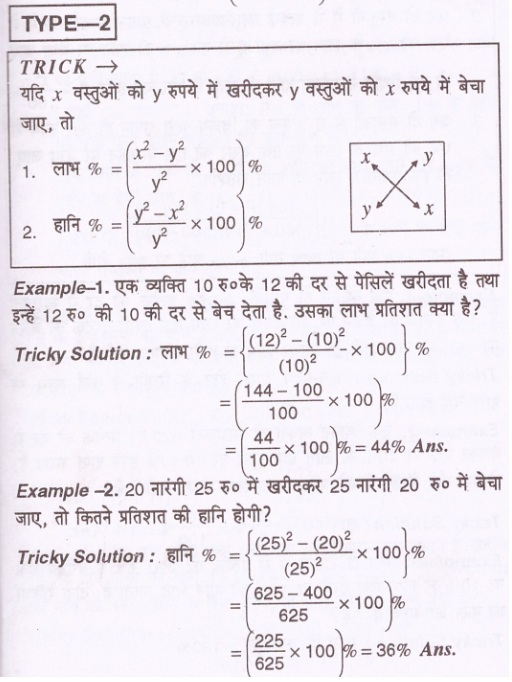 Example:- A person buy pencil at the price of 10rs per 12 pencils and sold it at the rate of 12rs per 10 pencils, then find the profit% ? 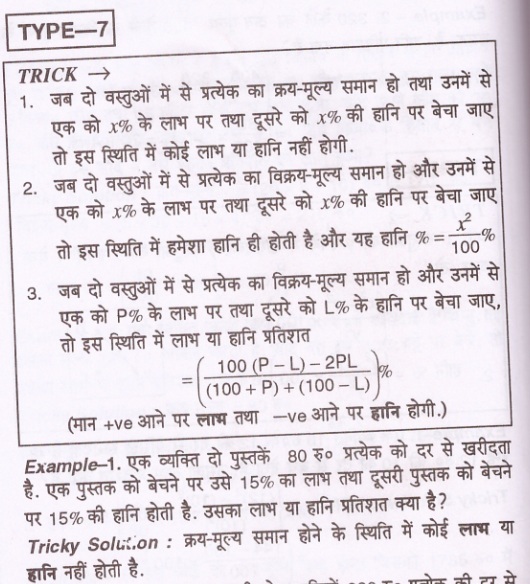 Example:- A fruit seller buy oranges at 5 rs per 3 and sold it at the rate of 4 rs per 2 oranges, then find profit% ? 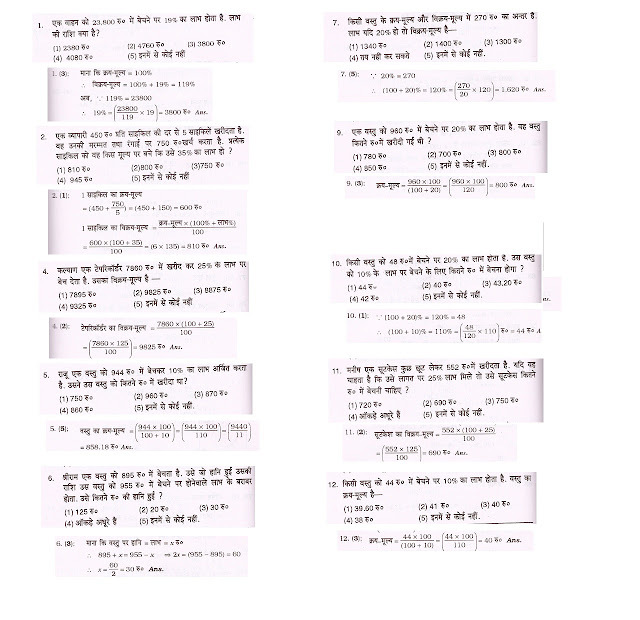 Example:- A shopkeeper sell 150 buttons and got profit of price of 25 buttons, then find profit% ? 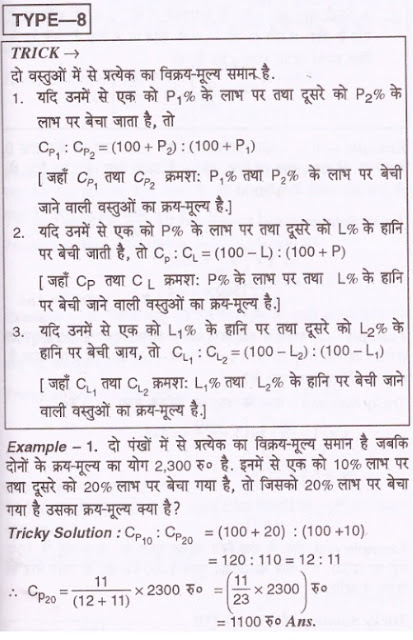 Example:- A businessmen at the time of buying used a defective weigh machine and cheated of 10% and at the time of selling cheated of 10%, then find total profit% ? Example:- A shopkeeper sold his product at the cost price , but at the place of 1kg weight he used 960 gm, then find profit percent% ? 1. If cost price of two products is same and he got X% profit on first product and loss of X% on second then there is no profit or loss. 2. If selling price of two products is same and he got X% profit on first product and loss of X% on second then there is always loss and that loss% = [X^2 / 100]%. 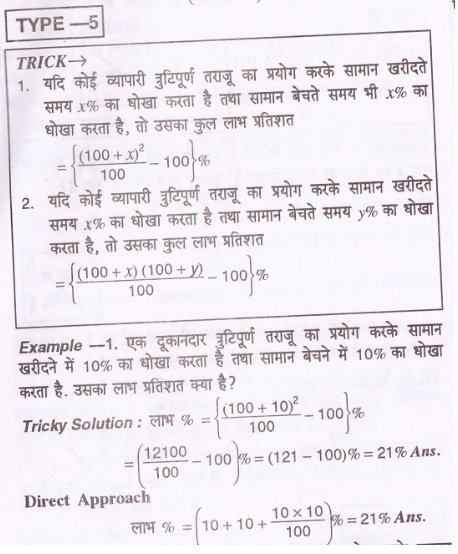 Example:- A person buy two book both at 80 rs , on selling one book he got profit of 15% and loss on selling second book , find profit or loss percent? Example:- Selling price of two fans is same , priented cost price of both is 2300 rs. one of them is sold at 10% profit and second is sold at profit of 20%, then find there cost price ? 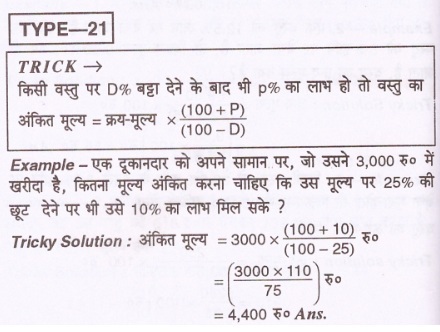 Example:- If on selling a product on 240 rs , profit of 20% is gain , then find its cost price? Example:- A electric iron is sold at 15% profit, if it will sold at 600 rs then we get 20% profit, then find its selling price? Example:- A purchase a cycle and sell it B at 20% profit and B sell it to C at 25% profit , if cost price for C is 1500 rs , then at how much price did A purchase it ? Example:- If a product is sell at 20% profit instead of 15% profit , then its selling price will become 500 rs , find its cost price? Example:- On selling a watch at 820 rs same profit will be gained that loss is happen on selling it at 650 rs , find cost price of the watch? Example:- On selling a product at 96 rs profit percent will become equal to numerical value of cost price, then find cost price of that product? 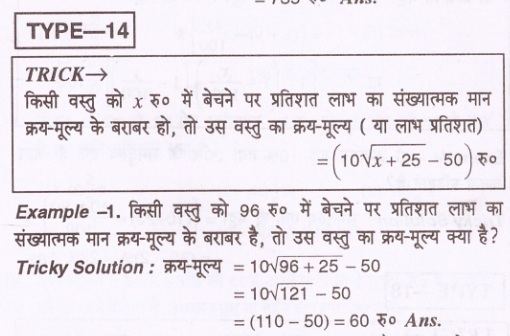 Example:- On selling a product at 140 rs instead of 120 rs the profit become double, find cost price of that product? Example:- The profit on selling a product at 840 rs is double of loss on selling that product at 600 rs , then find the cost price of that product? 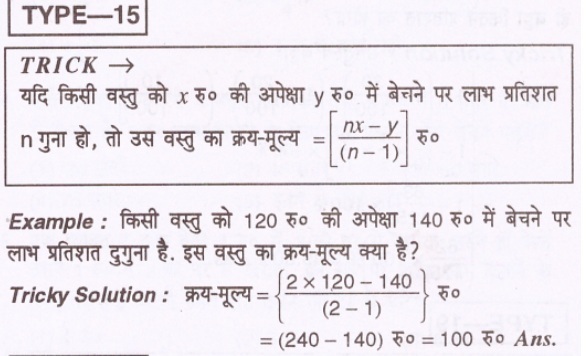 Example:- What is the similar consecutive value of 10% and 20% ? 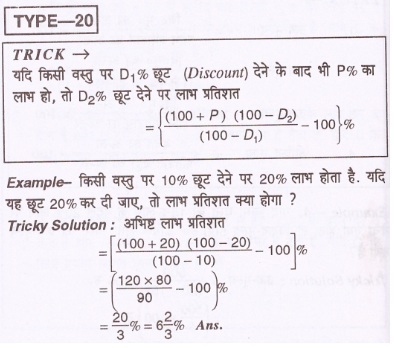 Example:- What is the similar consecutive value of 10% , 20% and 30% ? Example:- A shopkeeper after giving the discount of 20% , earn profit of 20% , then what is increase in percent of print rate with respect to cost price? 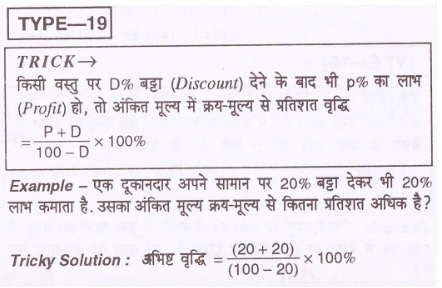 Example:- On giving discount of 10% then profit is 20% , if this discount will be 20% then what will be profit percent? Example:- If a shopkeeper by a product at 3000 rs , what will be print rate so that on giving 25% of discount he will got profit of 10%?